Dear Participants, Bank of Baroda Department has released notification for Senior Relationship Manager & Territory Head Vacancies. 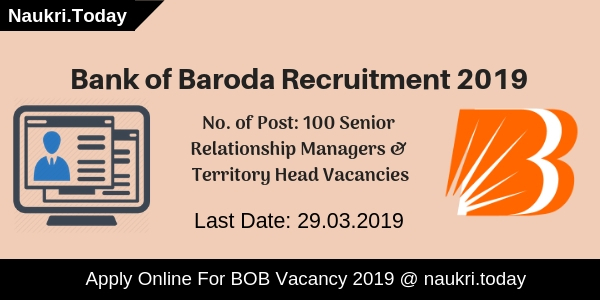 There are 100 Vacancies are available for Bank of Baroda Recruitment 2019. Candidates who have a Graduation Degree can fill up their application form through online mode. Online Registration will be started from 08 March 2019 for BOB Vacancy 2019. Applicants may apply online for Senior Relationship Manager Posts before 29 March 2019. Candidates have to pay Rs. 600/- as an application fee expect SC/ST/PWD Category aspirants. Read below article for furthermore information. What is the Eligibility Criteria for BOB Specialist Officer 2018? Check Who are Eligible For Bank of Baroda SO Recruitment 2018. Check the Application Fees, Selection Process & Pay Scale for Bank of Baroda Bharti 2018. Online Registration for Bank of Baroda Specialist Officer jobs 2018 – How to fill the Application Forms for Bank of Baroda Recruitment? Selection Fees For Bank of Baroda Probationary Officer vacancy 2018 – How to Select For BOB Recruitment 2018? Required Education Qualification Participants should have Graduation Degree in any subjects from a recognized university of government. MBA Candidates should be selected first. Minimum 3 years of experience required as a Senior Relational Manager. 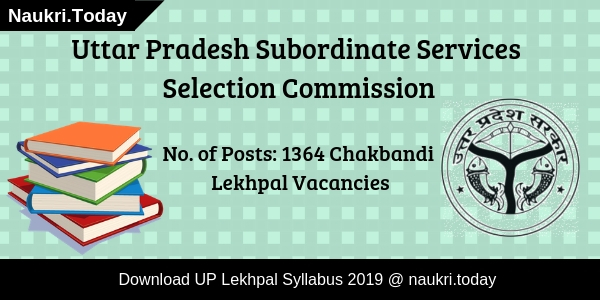 Selection Process For Bank of Baroda Recruitment 2019 Candidates should be selected on the basis of Written Examination, Personal Interview, & Group Discussion. Pay Scale for Bank of Baroda Jobs 2019 as per market benchmarked and it’s on applicant’s qualification. Where Should be Selected Candidates will Get Posted? Selection Candidates for the Post of Senior Relationship Manager will be posted at Ahmedabad, Anand, Rajkot, Surat, Vadodara, Indore, Mumbai, Jalandhar, Kota, Udaipur, Chennai, Kanpur, NCR, Kolkata. And applicants will get select for Territory Head Posts will be placed at Hyderabad, Bengaluru, Mumbai. For more information aspirants may download Bank of Baroda Notification from here. What Is The Payment Method of an application fee for Bank of Baroda Vacancy 2019? Candidates should pay their application fee through online mode as well as through offline mode. Participants should use their Credit Card, Debit Card, & Net banking for the payment of an application fee for Bank of Baroda SRM Jobs 2019. Conclusion: Bank of Baroda has released notification for 100 Senior Relationship Manager & Territory Head Vacancies. Applicants should collect here eligibility criteria details for Bank of Baroda Recruitment 2019 from here. Good news for the candidates who are searching Bank of Baroda Recruitment 2018. Bank of Baroda is inviting you for a good opportunity. Interested candidates can apply for BOB Specialist Officer Recruitment 2018. 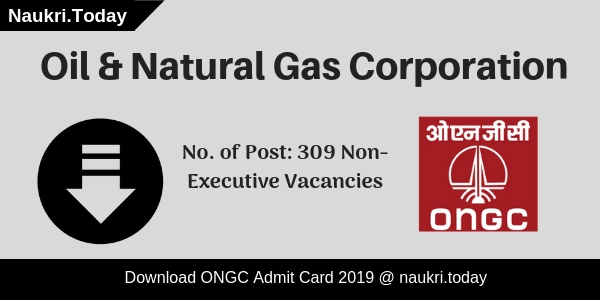 There are 913 SO vacancies available for the candidates. The starting date for Online Registration is 05.12.2018 and the last date for applying for BOB SO Jobs is 26.12.2018. For more details about the Eligibility criteria, Age Limit can check through the given links below. Bank of Baroda has recently issued notification for filling up 913 Specialist Officer Vacancy. Interested and eligible candidates can apply online for BOB SO Vacancy 2018 either here or visit the official site. Here we provide all information related to Bank of Baroda SO Recruitment. This is a good opportunity for candidates who are searching for bank jobs. Furthermore, the details you can collect from our below article. So read it carefully. The candidates who are applying for Bank of Baroda Recruitment 2018 can check the eligibility criteria from here. The candidates must look for Qualification & Age Limit for BOB SO Vacancy 2018. For more details candidates can visit the BOB Notification. Check below criteria to ensure your eligibility. Candidates should complete Bachelor of Law for Legal BOB SO Vacancy. For Wealth Management Services – Sales: Candidates should complete their Graduation from any stream. Applicants also have 05-year work experience on Wealth Management Solution. The candidates who are applying for Bank of Baroda Bharti 2018 should have the minimum age limit 21 years old. Maximum age limit for Bank of Baroda Vacancy 2018 should not be more than 35 years old. For more information about Bank of Baroda Recruitment 2018 can check notification. The candidates who are applying for Bank of Baroda Vacancy 2018 for them upper age relaxation is available. The candidates who belong to SC/ST or Ex-Servicemen category having the 5 year relaxation. For PWD candidates 10 year age relaxation. The OBC category candidates have 3 years relaxation. For more information about age criteria candidates can visit the BOB Specialist Officer Bharti 2018 Notification. The candidates who are interested in and applying for BOB Specialist Officer Jobs 2018 can fill the application forms. Candidates who belong to General and OBC category their Application Fees is Rs 600/- Bank of Baroda. For SC/ST/PWD candidates their Application Fees is Rs 100/- for BOB So Recruitment 2018. Fees will be made through online mode only. For more information visit the Bank of Baroda Recruitment 2018 Notification. The candidates who are applying for BOB SO Recruitment 2018 their selection is based on Online Examination, GD/ Interview Process. The online test will comprise 200 multiple choice questions. It contains equal 200 marks. 0.25 will deduct as per penalty of every wrong answer. For more information Visit the Bank of Baroda Recruitment 2018 notification. The candidates who get selected for their pay scale visit the BOB Specialist Officer Vacancy 2018 salary as follows category wise. The candidates who are applying for this job can fill the application forms. Few steps are required to fill the application form For information candidates can visit the 2018 Bank of Baroda Vacancy 2018 Notification. Take out print for future use. Apply directly to click on below links. Conclusion: Bank of Baroda Recruitment 2018 has been announced notification for 913 Vacancies. Candidates can apply for online registration from 05.12.2018 for Bank of Baroda SO Jobs. Last Date to apply online is 26.12.2018. Participants can check the information from BOB Recruitment 2018 Notification. Details are mention also on the above article. Are you want to admission in Post Graduate Certificate in Banking & Finance Program? If yes, then here is the latest news for you. Bank of Baroda has recently released notification for Bank of Baroda Recruitment 2018 for 600 Probationary Officer Vacancy. The online registration for BOB PO Vacancy is 12.06.2018. Applicants can fill online application form either here or official site till last date 02.07.2018. Apply Online Here for BOB Probationary Officer Jobs 2018. Furthermore, the information you require to read this article carefully. BOB Notification is out for admission in 09 months Post Graduate Certificate in Banking and Finance Course. After this course applicants will appoint for Probationary Officer In Junior Management Grade/ Scale – I. So if you are interested and eligible apply online for Bank of Baroda Vacancy either here or official site. You can fill the application form between 12.06.2018 to 02.07.2018. Furthermore, details of BOB PO Recruitment such as eligibility criteria, application fees, selection procedure, how to apply and other are mention below. Bank of Baroda Recruitment 2018 Category Wise information is as under. Applicants who wish to apply must check own eligibility conditions for BOB PO Recruitment 2018. If they are not eligible for Probationary Officer post then they can’t apply online. BOB Vacancy eligibility criteria information is mention below. Candidates must have Bachelor Degree in any discipline with minimum 55% marks from recognized university. SC/ST/PWD candidates qualifying marks is 50%. Furthermore details check official BOB Notification. As on 20.07.2018 candidates minimum age require 20 years. For BOB PO Recruitment candidates should not be more than 28 years. Upper age relaxation is applicable as per govt. norms. For filling up Bank of Baroda Recruitment 2018 applicants also need to pay an application fees. The application fees once paid not refunded. 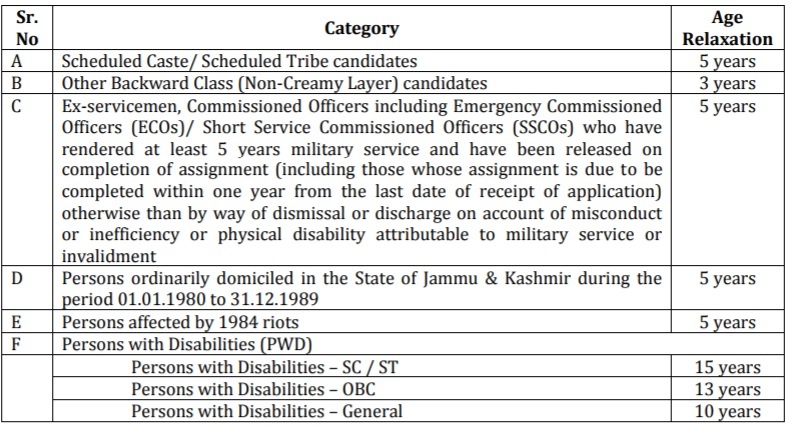 Candidates who are belonging to SC/ST/PWD category are require to pay Rs. 100/- towards BOB Probationary Officer Jobs 2018. General and OBC candidates have to pay Rs. 600/-. Applicants should pay Bank of Baroda Vacancy application fees through online mode. More details check official notification. Applicants will be selected for their performance in online exam, GD, PI and Psychometric test. First applicants are invited for online examination. After qualify the written examination they will call for Group Discussion, personal Interview and Psychometric test. For Bank of Baroda Recruitment online examination details are as under. Applicants who want to apply and also eligible for BOB Recruitment may apply through online mode only. No other mode application will not be accepted. Candidates can fill Bank of Baroda Jobs online application form either here or official site. Here in below section, we mention some of the instructions which will helpful for you. If you are going to apply for BOB PO Recruitment, then you must have valid email id and Mobile no. You also require photograph and signature. Download BOB Notification and read it carefully. Apply Online for Bank of Baroda PO Jobs 2018. Enter all require information on your application form. Submit the details and then go to apply online for Bank of Baroda Recruitment. Enter all require information like personal and educational. Submit your Bank of Baroda Jobs online form. Now you BOB Probationary Officer Vacancy Form is accepted. Conclusion : Bank of Baroda recently issued notification for recruitment of 600 Probationary Officer Posts. Candidates who are interested and deserving may apply through online mode from here. The online registration link is available on above section. Hey Candidates, If you are looking for Bank of Baroda Recruitment 2018 then your search is over here. Bank of Baroda is providing you nice opportunity for 590 Sales Executive Jobs. Candidates can fill Online Application Forms before 25.05.2018 for Bank of Baroda SE Recruitment 2018. For more details about the Eligibility Criteria and Selection Process for Sales Executive post visit the given links below. Candidates who are applying for Bank of Baroda Job 2018 can check the Eligibility Criteria mentioned in Below links. Given links contains the information regarding Education Qualification and Age Criteria. For more details candidates can visit Bank Of Baroda Recruitment 2018 notification. Candidate must hold Graduation Degree from any Government recognized University or Institution. Applicants also have relevant work experience in their particular Department for BOB Sales Executive Recruitment 2018. For more details candidates can check BOB Official Notification. Candidates should have minimum age limit 21 years old for Bank of Baroda Recruitment 2018. Maximum age limit should not more than 40 years old for BOB Vacancy 2018. Candidates who are applying for Bank of Baroda Recruitment 2018 their selection is based on Written Aptitude Test. Applicants who clear the Written Exam will be called for Interview or Group Discussion. Further information candidates can visit the Bank of Baroda SE Vacancy 2018 notification. Candidates who got selected for Bank of Baroda Vacancy 2018 will get a salary based on CTC as per market benchmarks. Negotiable Pay Scale will be based on candidate’s qualification, experience and overall suitability of the candidates. CTC will be fixed, However selected candidate will be eligible for Performance Linked Variable Pay which will be over and above the Fixed Salary but linked to the achievement of specific targets for BOB Sales Executive Bharti 2018. Candidates who want to fill Application Forms for Bank of Baroda SE Jobs can fill before 25.05.2018. Download easy steps for filling Online Application Form. Search for Bank of Baroda Notification pdf. Enter up the Name, DOB, Postal Address correctly in the BOB. Conclusion : Bank Of Baroda Recruitment 2018 for 590 posts of Sales Executive, Team Leader & Other posts . Eligible participants can apply online for BOB before 25.05.2018. Check more details from the official links given above.